Spicy fragrance, 3 to 4 Feet. Mid / Late July flowering. Looking like a fluffy spinning galaxy dotted with countless stars, we had to name this lily for our closest galactic neighbor. One of the most fluffy doubles we have seen, 'Andromeda' seems to have unending layers upon layers of cosmic beauty. 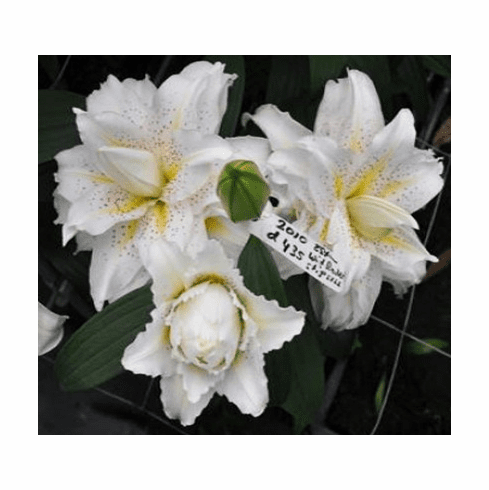 Being a double flower as well as being white, 'Andromeda' should have some protection from direct afternoon sun in areas of about 85 or more during mid to late July to insure the flowers do not sun burn. We just love the ruffled petals as well as the bursting star of yellow in the centers. This is the original, first time bloom selection photo from 2010. Eighteen years in the making, she is now ready for your garden. 3 to 4 Feet. Mid / Late July. Very fragrant.